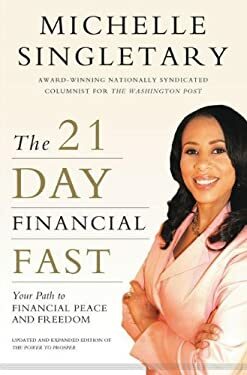 Financial Peace and Freedom in 21 Days In The 21-Day Financial Fast, award-winning writer and The Washington Post columnist Michelle Singletary proposes a field-tested financial challenge. For twenty-one days, participants will put away their credit cards and buy only the barest essentials. With Michelle s guidance during this three-week financial fast, you will discover how to: Break bad spending habits Plot a course to become debt-free with the Debt Dash Plan Avoid the temptation of overspending for college Learn how to prepare elderly relatives and yourself for future long-term care expenses Be prepared for any contingency with a Life Happens Fund Stop worrying about money and find the priceless power of financial peace As you discover practical ways to achieve financial freedom, you ll experience what it truly means to live a life of financial peace and prosperity. Thousands of individuals have participated in the fast and as a result have gotten out of debt and become better managers of their money and finances. The 21-Day Financial Fast is great for earners at any income-level or stage of life, whether you are living paycheck-to-paycheck or just trying to make smarter financial choices. " New (322 available) BRAND NEW. Over 1.5 million happy customers. 100% money-back guarantee. Make your purchase count: support Better World Books' worldwide literacy partners.